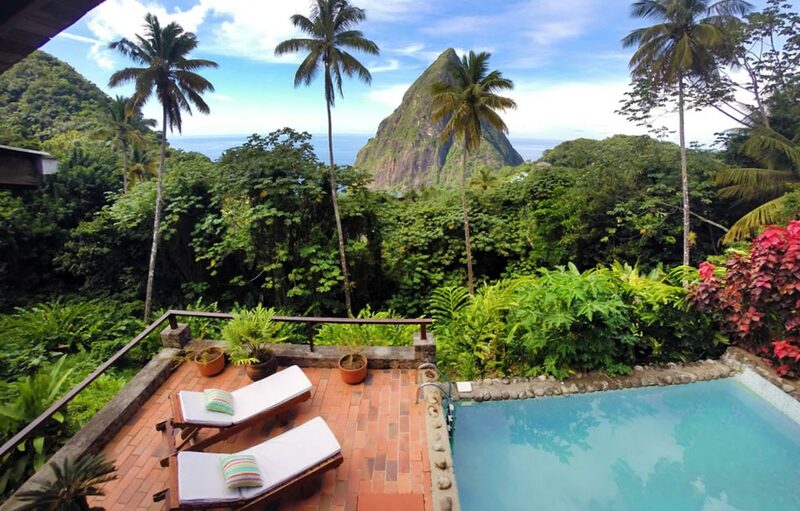 The Jaco Pitons Villa is named after the local word for the St. Lucia parrot, the “jacquot” parrot, and is the sister villa to our very own, Coco Pitons Villa. 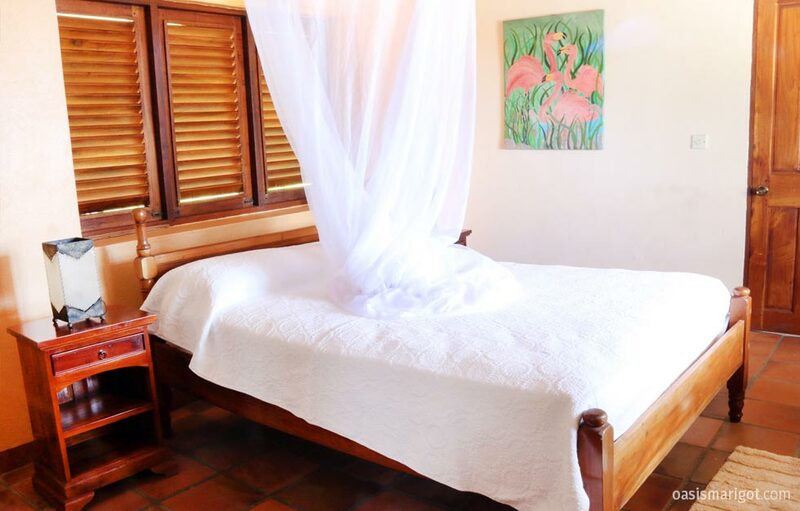 Located on the fringes of a World Heritage Site, the Jaco Pitons Villa is one of our most secluded and most private, with tropical jungle-like plants and trees all around. 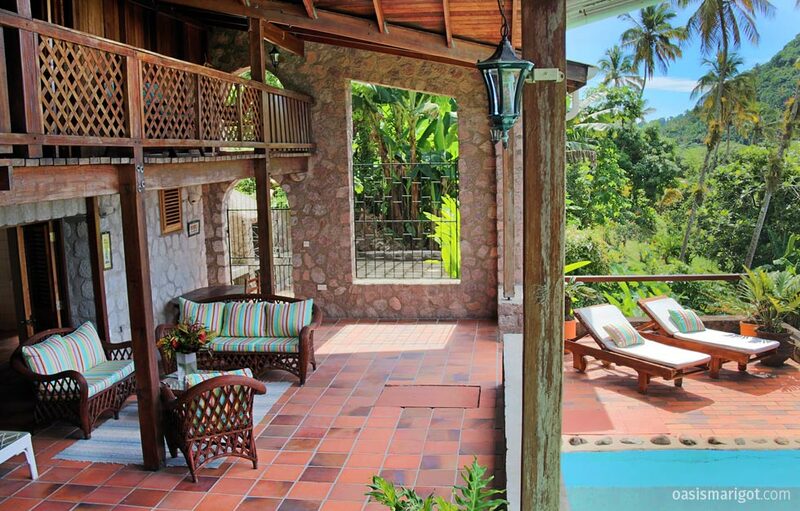 Staying at this villa truly feels like you are in the authentic St. Lucia, the way it was meant to be. 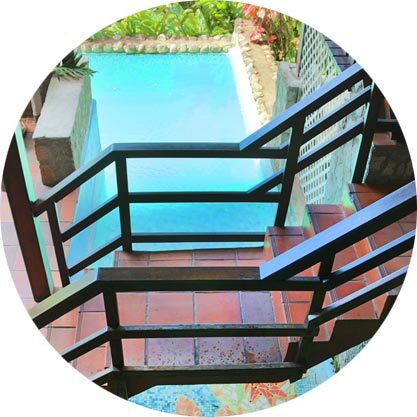 Enjoy the tropical sounds, scents, and nature which are sure to greet you. 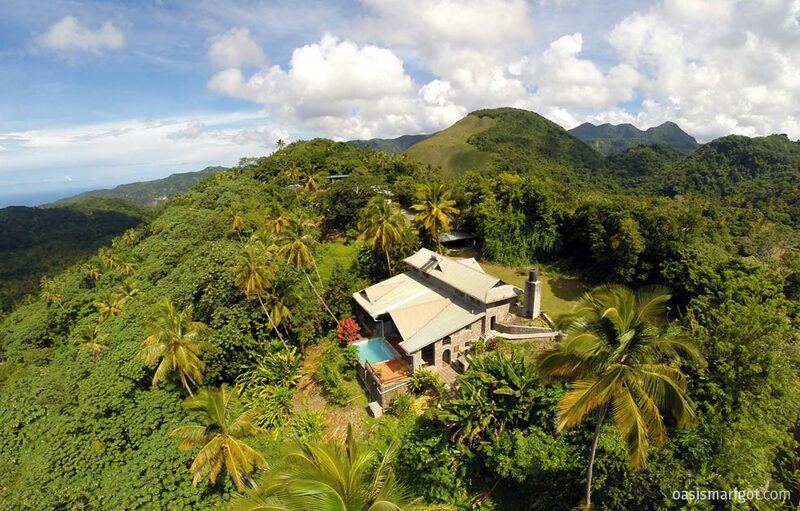 This villa is a heaven for nature-lovers and bird watchers. 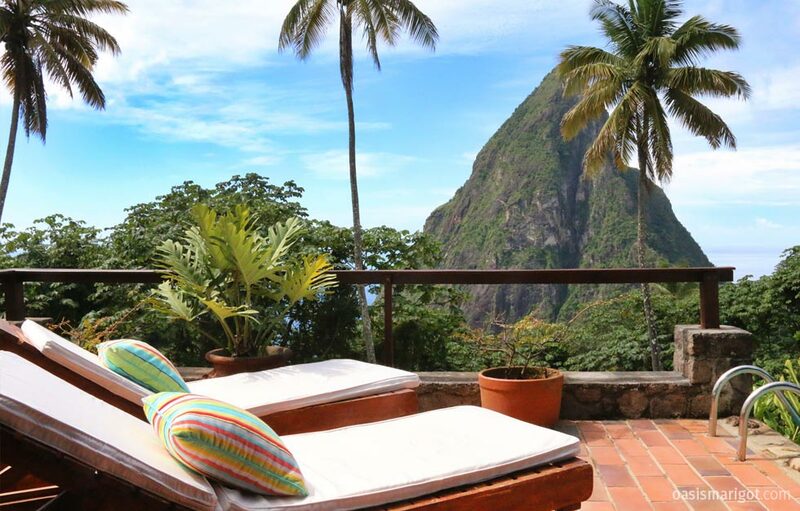 A truly unique and “off the beaten path” vacation rental, the Jaco Pitons Villa beholds one of the most rare and valued views in Saint Lucia – the enchanting Pitons Mountains. 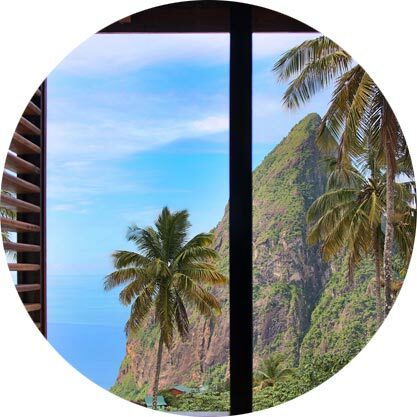 Your view extends down the pristine forest covered slope to the water’s edge, where the magnificent peak of the Pitons rises out from the ocean into the sky. The open-wall style architecture of the villa lets you enjoy the view from anywhere in the house, and always provides for cooling breezes, fresh air, and an atmosphere like you’ve never experienced before. The villa uses local wood and stones to meld this unique and wonderful open-wall design. A waterfall wall leads down to a intriguing “L”-shaped pool. The living area is protected by the overhanging roof, where you can easily switch between sun and shade. 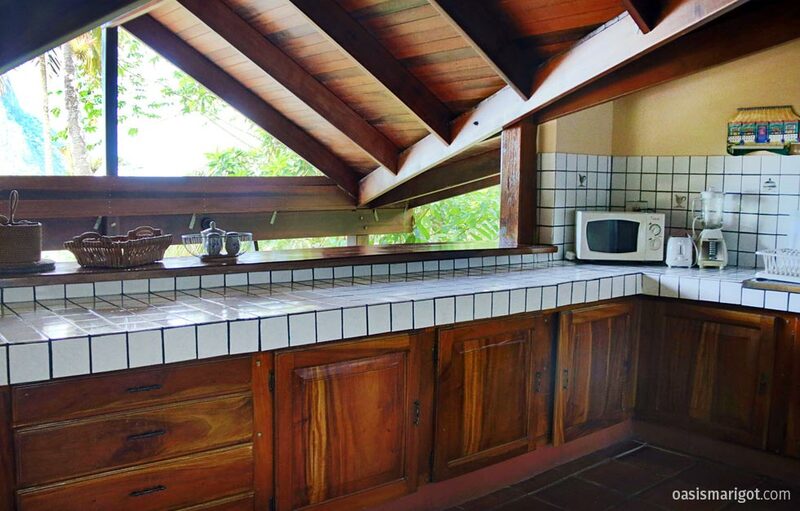 The mid-level holds the very spacious, fully-equipped and modern kitchen, where a few steps down lies the dining area in a very tropical setting. 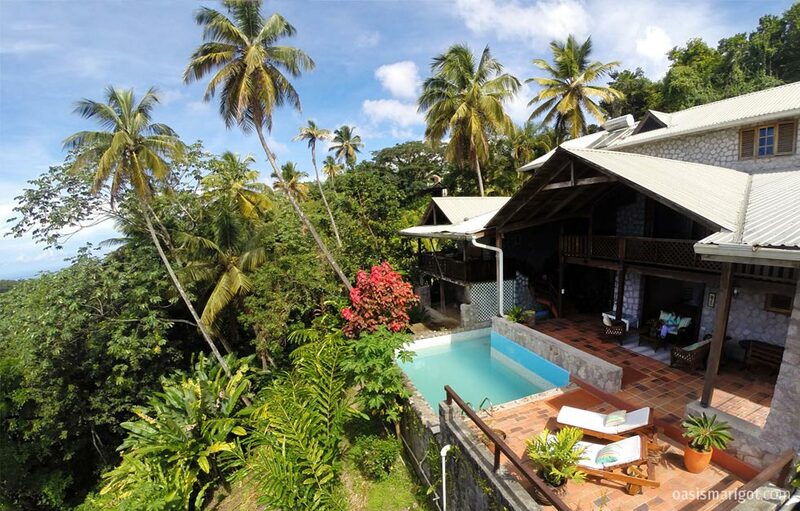 The villa has 4 bedrooms, accommodating up to 8 people. 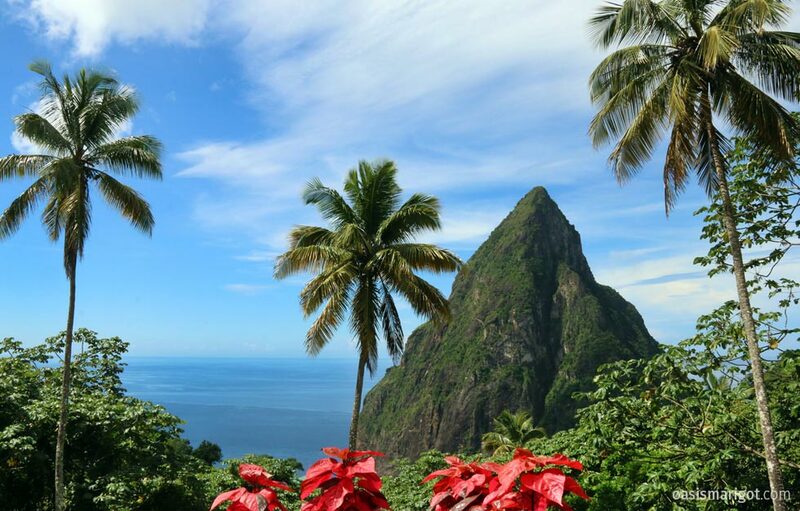 For all our villas in the Soufriere area, we always recommend you rent a car. It will make your vacation much more free-spirited and smooth, not having to wait around for taxis. At the time of a reservation, we would be happy to help arrange a rental vehicle for you. 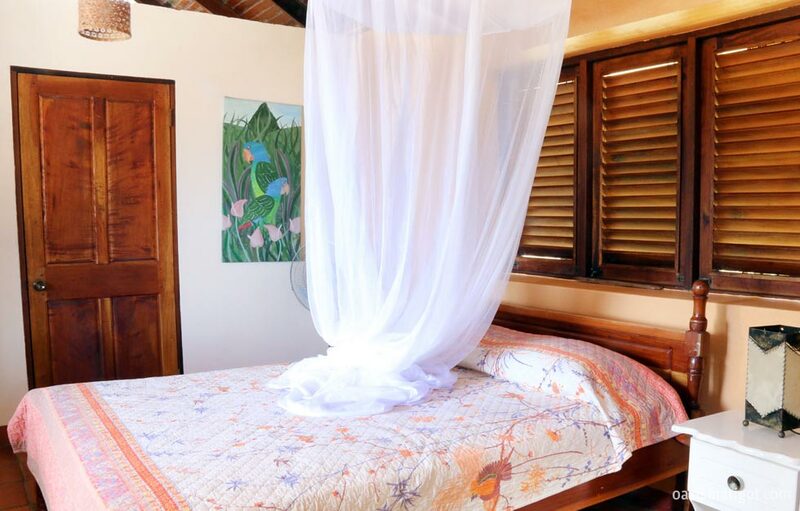 The villa is less than a 10 minute drive to the beautiful beach between the Pitons, where there is snorkeling, diving, and sailing available as well as a couple restaurants accessible from the Sugar Beach Viceroy Resort. 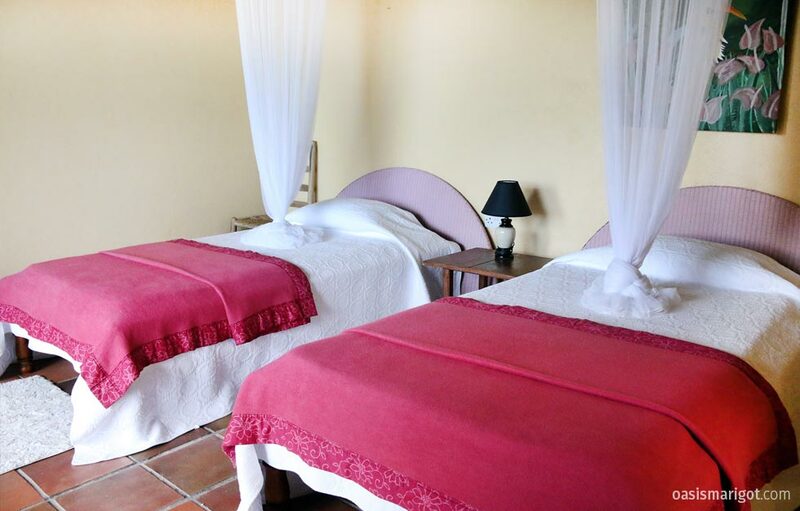 There are other restaurants located around the villa as well, including the award winning Dasheene Restaurant at the Ladera Resort, just 5 minutes away. 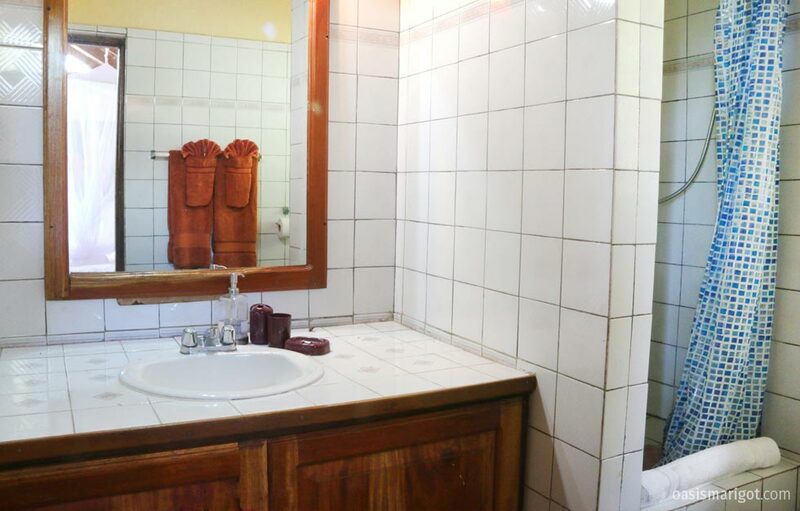 Groceries and other shopping needs can be taken care of in Soufriere, just a 10-15 minute drive from the villa. 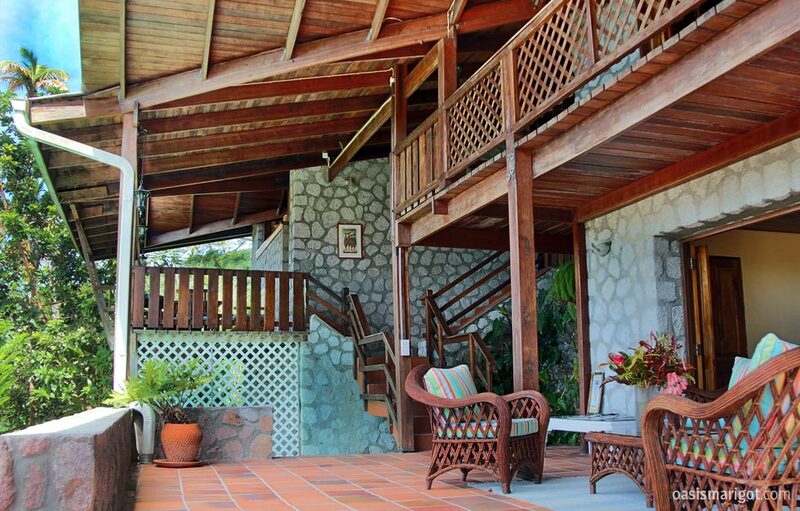 Here at Oasis Marigot, we do our best to make your vacation rental your vacation home. Cook Available: Local Meals by Mary Jane (Housekeeper); Breakfast Can be Made at No Charge (After 9am). Extra Meals are US $18 per person (Paid Directly to Mary Jane). Guests Are Responsible for Providing the Provisioning/Food. Guests can Submit Grocery List Prior to Arrival at Cost plus 15% Service Charge. “The view is simply Breath-taking and amazing each time to glance at it. 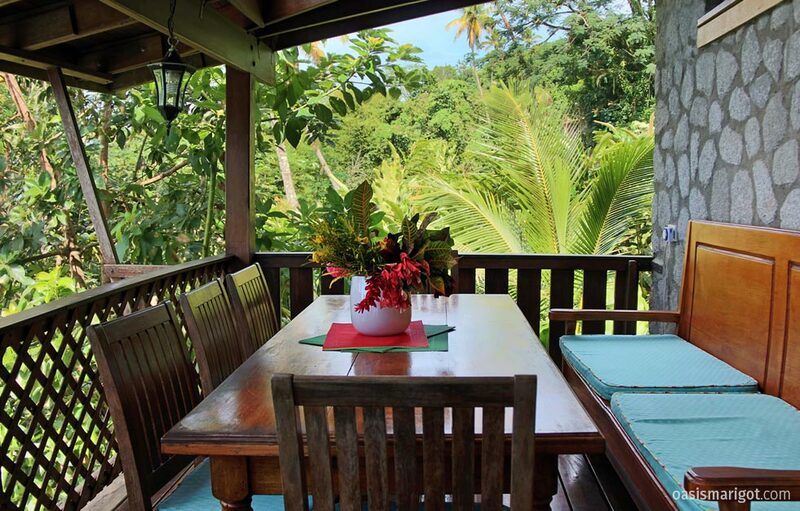 The house is beautiful and surrounded by many flower varieties and fresh fruit trees- go explore! Pool is great for a hot day cool down or a refreshing evening dip. Minimum Stay: 5 nights, except during holiday season; 7 nights. Please inquire for availability of this property.